Leaving the shop on west 44th Street, a building that now serves as a storage warehouse, I was faced with two ways of reaching Penn Station: I could take the 'scenic route' of 42nd Street to Seventh Avenue, or I might choose to follow Ninth Avenue down to 33rd Street. Late afternoon was a good time to shoot the buildings and storefronts in 1988, since there was really no high-rise development around Hell's Kitchen then, and the late afternoon light fell nicely on the aged buildings. Even with all the sparkling residential high-rises that have erupted from its worn gray asphalt, these streets today, around the west side of the Port Authority, still maintain their air of insouciant grime. 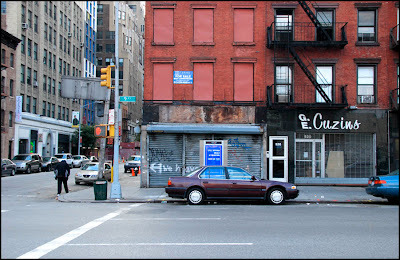 Ninth Avenue, in the blocks below and south of the bus ramps, was an array of meat stores, bakeries and delis in the 1980's, most notable were the Manganaro's stores: two delicatessens next to each other, owned by feuding members of the family that first made a six-foot-hero. I assume that neighborhood allegiances are still strong, as well as equally divided: both stores prosper after decades side-by-side. 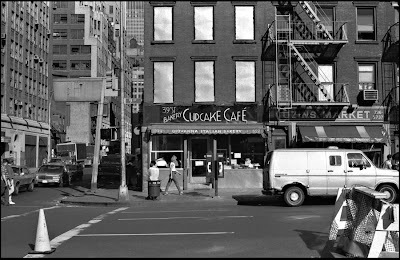 But my favorite storefront was the Cupcake Cafe, mainly for the sign. You just didn't see lettering like that anywhere. It was hand-painted, and each letter was a different size, to create an undulation across the words. The cupcakes and muffins were pretty well made, too. And in a happy ending, though the Cafe is no longer at this corner, a close look at the roll-down gate reveals a crudely painted arrow and the partial phrase, "We h-". Blocked by the parked car and phone booth (phone booth?!) is the rest: "-ave moved". Across the street and one block north. Still good pastries. I like your blog and your photos! How nice the cafe survived long enough to experience the INCREDIBLE renaissance of popularity that is currently being enjoyed by cupcakes, as evidenced by the ridiculous number of blogs devoted to them. I mean come on, they're just small cakes, people! Get a grip! I was more interested to hear about the deli that first made a 6-foot hero, that now-staple of casual gatherings everywhere. Tell us more!